Antithrombotic therapy is the cornerstone of the treatment of acute coronary syndromes, but there is now evidence which indicates that by blocking inflammation, thrombosis and thus, acute coronary events, could be lowered. The concept of athero-inflammation emerges as the meeting point of different morbidities; dyslipemia, diabetes, hypertension, obesity, immunity, infection, hyperhomocyteinemia, smoking, etc. usual named as risk factors. Thus, beside specific drugs, earliest treatment, in the stage of inflammation, using anti-inflammatory drugs, should be considered since in patients with increased risk of acute coronary process are likely to have many point of origen throughout the coronary arteries. There are a body of evidences for supporting the potential of anti-inflammatory therapy to the prevention of inflammation and atherosclerosis. COX-2 inhibition may decrease endothelial inflammation reducing monocytes infiltration improving vascular cells function, plaque stability and probably resulting in a decrease of coronary atherothrombotic events. Trials including large numbers of patients in prospective double-blind randomized studies worthwhile to confirm the efficacy of NSAID, mainly, COX-2 inhibitors, together with aspirin in the prevention of coronary events in patients with acute coronary disease. Antithrombotic therapy is currently the cornerstone of the treatment of acute coronary syndromes . Findings indicate the importance of inflammation in atherothrombosis and support therapeutic use of anti-inflammatory treatment . Thrombosis, as consequence of activation of platelets, thrombin generation through the coagulation cascade and inhibition of the fibrinolytic system, follows inflammation and end in an acute coronary syndrome (Figure). There is now evidence that blocking inflammation could lower thrombosis and thus acute coronary events. There is evidence of an inflammatory component in the pathogenesis of atheroma rupture in acute coronary events. 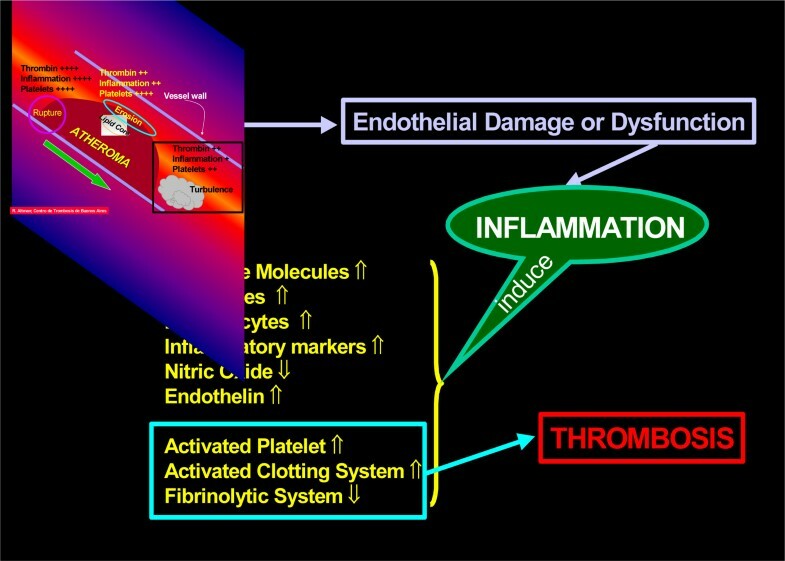 Inflammation comes about in response to endothelial injury or dysfunction or hemo-reological modifications and precede thrombus formation. Combining aspirin and heparin is the antithrombotic treatment of choice in patients with unstable angina, but therapy starts when the clot is already constituted and the coronary lumen totally or partially occluded. Furthermore, thrombus formation results from several different pro-aggregating platelet stimuli and through more than one mechanism of thrombin generation. Aspirin acts by irreversible acetylation of cyclooxygenase-1 (COX-1), reducing the production of pro-aggregating thromboxane A2 in platelets and formation of the platelet aggregation inhibitor prostacyclin in the vascular wall. Acetylsalicylic acid is a relatively weak antiplatelet agent and the conjoint activities of two agonists can overcome the inhibitory effect of aspirin on platelet aggregation . The main question is whether, for the prevention of cardiovascular events, other effects of aspirin could be as important or more important than its inhibition of platelet aggregation. Chlamydia pneumoniae is known to infect and replicate in cell types found within the atherosclerotic lesion, including endothelial cells, smooth muscle cells, and macrophages [8, 9]. Infection of these cells results in increased expression of pro-inflammatory cytokines and adhesion molecules. The cardio-protective effect of aspirin at low concentration may be due, at least in part, to inhibition of growth of C pneumoniae due to the inhibition of C pneumoniae-induced NF-κB activation . Aspirin therapy appears to be particularly effective among individuals with high CRP levels . This was detected in a subset of healthy men in the Physicians Health study. In patients within the highest quartile of C-reactive protein elevation the benefit of aspirin (325 mg/day every other day) was most significant compared with the lowest quartile. In patients with coronary artery disease aspirin also seems to reduce C-reactive protein levels . Therefore, aspirin may prevent coronary thrombotic disease through systemic effects independent of its antiplatelet action. These findings reflect a potential antibacterial effect as well as inhibition of the clotting mechanism, plaque growth, and inflammation. It remains to know whether patients benefit derive from COX-2 inhibition capacity of aspirin. Thus the range of influences of aspirin could reflect its anti-inflammatory effect rather than its anti-platelet properties . The use of aspirin has increased since it was shown to reduce the risk of myocardial infarction and stroke [14, 15], although meta-analysis suggested that the data were inconclusive . Although aspirin is a widely used weak platelet aggregation inhibitor there are discrepancies on its efficacy in preventing coronary events [16–19]. The thienopyridines ticlopidine and clopidogrel are inhibitors of platelet function in vivo and frequently used as an antithrombotic agent in coronary disease. Clopidogrel is an inactive thienopyridine prodrug that requires in vivo conversion in the liver to an active metabolite that exerts its antiplatelet effect by forming an inactivating disulfide bond with the platelet P2Yac (P2Y12) adenosine diphosphate (ADP) receptor . Clopidogrel may have some anti-inflammatory effects. Clopidogrel decreased serum level of soluble intercellular adhesión molecule-1 (ICAM-1) and diminished chemokinesis of monocytes . Klinkhardt et al [22, 23] showed that platelet-leukocyte aggregate formation enhanced in atherosclerotic vascular disease was reduced by effect of clopidogrel. This effect appeared to be increased by combining ticlopidine and aspirin . Opposite to the potential anti-inflammatory activity of clopidogrel, a patient who developed a systemic inflammatory response syndrome after receiving clopidogrel before coronary angiography and stent implantation was published. The reaction was resolved after withdrawal of the drug..
Other NSAIDs have been investigated for beneficial effects on the risk of cardiovascular thrombosis. Flurbiprofen was evaluated in a double-blind, pacebo-controlled, multicentre study for preventing reinfarction or reocclusion after thrombolysis or coronary angioplasty in patients with acute myocardial infarction . Indobufen, a reversible cyclo-oxygenase inhibitor, was compared with a combination of aspirin and dipyridamole in patients who had undergone coronary artery bypass surgery in two prospective, randomized, double-blind clinical trials, performed in the United Kindom and Italy . In the Brochier's study , 233 patients were treated with flurbiprofen 50 mg twice daily and 228 patients with placebo. The reinfarction rate during the 6-month follow-up was 3% in the group treated with the active drug and 10.5% in the placebo group (P < 0.001). These results indicated that flurbiprofen reduced the rate of myocardial infarction compared with placebo and that its efficacy was similar to aspirin+ dipyridamole for preventing graft occlusion after coronary artery bypass surgery. The effect of NSAIDs after acute myocardial infarction was also investigated retrospectively in the DAVIT study  where 88 patients received regular randomized non-steroidal anti-inflammatory drugs treatment. It was concluded that treatment was safe with regard to mortality and re-infarction. In the multivariate analysis a non-significant beneficial trend in favor of NSAIDs was observed. The lack of significance was attributed to the small sample size . The effects of NSAIDs including naproxen on the risk of serious coronary heart disease was studied observationally by Ray et al . The study included 181441 users of NSAIDs and equal numbers of non-users. The endpoint was hospital admission for acute myocardial infarction or death from coronary heart disease. Uninterrupted use for more than 60 days conferred no protection on the NANSAID users. The authors suggested that in the absence of any protective effect of naproxen or other NANSAIDs on risk of coronary heart disease, these drugs should not be used for cardioprotection . Rahme et al. compared the effects of naproxen vs other NSAIDs on the prevention of acute myocardial infarction in patients aged 65 years or over. In 4163 cases and 14160 controls they found that compared with other NSAIDs, concurrent exposure to naproxen had a protective effect against acute myocardial infarction . From the few published trials, therefore, the effect of NSAIDs in the prevention of acute myocardial infarction is controversial. Although complex and apparently conflicting data have been obtained, and some results concerning the use of aspirin have been challenged , its effect is more widely accepted than other NSAIDs. Its inhibitory effect on COX-1 is probably most important for the prevention of thrombotic coronary disease. Cyclooxygenases (COX-1, COX-2) are involved in thromboxane and prostacyclin formation and in the inflammatory process. COX-1 synthesizes prostaglandins from arachidonic acid and the two most important active final products, thromboxane A2 and prostacyclin, regulate platelet function. COX-2 is inducible, for example by pro-inflammatory cytokines and growth factors, implying a role for COX-2 in both inflammation and the control of cell growth . COX-2 promotes early atherosclerotic lesion formation in LDL receptor-deficient mice in vivo . The toxicity of NSAIDs is related to COX-1 inhibition. In the stomach COX-1 inhibition diminishes the synthesis of protective prostaglandins. The new drugs with more selective COX-2 inhibition activity reduce inflammation without removing the protective prostaglandins in the stomach, so they cause fewer gastrointestinal complications than traditional NSAIDs . Aspirin acts by irreversible acetylation of a serine residue at position 529 in COX-1 reducing thromboxane A2 generation in platelets and prostacyclin formation in the vascular wall. COX-2 inhibitors do not affect platelet COX-1 activity but block prostacyclin formation in endothelial cells [34, 35]. The data suggest that in vivo, prostacyclin modulates thromboxane A2-mediated interactions between platelets and the vessel wall. Thus an imbalance in the pro/ anti-thrombotic forces could be produced. The result is an increase of platelet activation, potentially shifting the haemostatic balance towards a prothrombotic state. A selective inhibitor of COX-2, celecoxib, significantly improved endothelium-dependent vasodilation; also, C-reactive protein was significantly lower after celecoxib than after placebo. Both effects could be relevant to chronic inflammation . Matrix metalloproteinases degrade most components of the extracellular matrix and basement membrane and may contribute to atherosclerotic arterial wall remodeling and to plaque rupture. Co-expression of COX-2 and metalloproteinase by macrophages in atherosclerotic plaque has been reported . COX-2 is involved in the inflammatory response via the generation of prostanoids that in turn are involved in the production of matrix metalloproteinases . Experimental results indicate a marked inflammatory response at stent implantation sites. Inflammation is involved in neointimal proliferation and restenosis. A high pre-procedural of plasma CRP and its persistent elevation has predictive value for risk of restenosis . Thus, a body of evidence supports the potential of anti-inflammatory therapy for preventing inflammation and atherosclerosis. COX-2 inhibition may decrease endothelial inflammation, reducing monocyte infiltration, improving vascular cell function and plaque stability, and probably resulting in a decrease of coronary atherothrombotic events . Concern that COX-2 inhibitors might predispose to cardiovascular thrombotic events came to center stage with publication of the VIGOR Study , where the COX-2 inhibitor rofecoxib was compared with the nonsteroidal antiinflamatory naproxen in patients with rheumatoid arthritis. The study showed a 5-fold increase in cardiovascular events associated with rofecoxib therapy. Nevertheless, there is no definitive evidence that COX-2 inhibitors increase (or decrease) the risk of myocardial infarction, and the VIGOR study results and similar findings have been challenged [41–45]. Indeed, the results are readily explicable in terms of a beneficial effect of naproxen rather than a detrimental effect of COX-2 inhibitors . Very recently, Mamdani et al. conducted a retrospective study in subjects aged 66 years or older in whom treatment was initiated with celecoxib, or rofecoxib, or naproxen, or non-naproxen non-selective NSAIDs. Observations were compared with a randomly selected control cohort not exposed to NSAIDs. The results indicated that COX-2 inhibitors did not increase the risk of acute myocardial infarction, nor did naproxen reduce the risk in the short term. To date, different studies have given controversial results. Depression of vascular prostaglandin I2 production in the absence of concomitant platelet inhibition , and concern about cardiovascular safety of COX-2 inhibitors , have enhanced awareness of the need for adjuvant antiplatelet therapy, mainly aspirin, in appropriate patients who are receiving COX-2 inhibitors , mainly when there is a comorbidity such as chronic vascular disease, hypertension, diabetes or dyslipemia. When the COX-2 inhibitor celecoxib was used together with aspirin there was no additional decrease in prostacyclin formation, and thromboxane A2 production was not increased . There have been few studies evaluating the use of NSAIDs with mainly COX-2 inhibitory effects in the treatment of acute coronary syndrome. In the MUNA trial , patients with a diagnosis of unstable angina were randomized to a 48-h course of methylprednisolone (n = 81) or placebo (n = 85). Forty-eight hours after randomization, mean C-reactive protein levels decreased by 2.6 mg. l-1 in the methylprednisolone group, but increased by 1.6 mg. l-1 in the placebo group (P = 0.03). Attainment of the primary end-point (in-hospital recurrence of angina, silent ischaemia on Holter recording, emergency coronary revascularization, readmission with unstable angina, or myocardial infarction or death) was not significantly different in the two groups: it occurred in 44% of the methylprednisolone patients and 33% of the placebo patients (P = 0.12) . In a double-blind, randomized, placebo control study, Versaci et al , employed oral prednisolone in 41 patients who had undergone stent implantation. The control group comprised forty three patients under placebo. All patients received combined aspirin and ticlopidine for 3 days before implantation. Prednisolone therapy was sustained for 45 days, starting with 1 mg/kg for the first 10 days. Only patients with a CRP level >0.5 mg/dl 72 h after the procedure were included in the study. Primary end-points were death, myocardial infarction, or recurrence of symptoms requiring additional revascularization. In this trial, prednisolone was associated with a 28% absolute reduction of clinical events (p = 0.0063) at 12-months follow-up and with a 26% absolute reduction of restenosis rate (p = 0.001) at 6-months follow-up . Results of both studies are controversial but the designs were dissimilar in several ways: patients with unstable angina were included in the MUNA trial and those after coronary artery stent implantation in the IMPRESS study; prednisolone doses were different; the treatments were 48 h and 45 days respectively; the follow up was 30-day in the MUNA study and 12-month in the IMPRESS study. There have been few studies evaluating the use of NSAIDs with mainly COX-2 inhibitory effects in the treatment of acute coronary syndrome. A pilot study was performed by Altman et al. employing meloxicam, a preferential COX-2 inhibitor. In 120 patients with acute coronary syndrome without ST-segment elevation, sixty patients were treated with meloxicam, 15 mg daily for 30 days. All patients received standard therapy with heparin and aspirin. The primary endpoint was the composite of recurrent angina, MI, or death during CCU stay and after 90 days of follow-up. A secondary endpoint was MI, death, and all revascularization procedures (percutaneous transluminal coronary angioplasty or coronary artery graft surgery). Events at coronary care unit as well as after 90 days of follow up were less frequent in the meloxican-treated group than in the placebo group. At 90 days of follow-up, the relative risk reduction was 55.1% (p = 0.015) and the absolute risk reduction was 26.6% for primary end points. The corresponding figures for secondary end points were 60.1 % (p = 0.015) and 20.0% respectively. Supported by the concept of athero-inflammation and by the result of trials where anti-inflammatory drugs were used, beside specific drugs use of anti-inflammatory drugs in the early stages of inflammation should be considered, since patients with increased risk of acute coronary process are likely to have many points of origin throughout the coronary arteries [50, 51]. The concept that coronary disease is a systemic disease of the entire coronary tree must be taken into account when treatment of patients with acute coronary disease is considered . Systemic medical therapy has proved superior to coronary angioplasty in such chronic high risk patients . If the emerging evidence for the central role of inflammation in the development of acute coronary disease is accepted, additional trials including large numbers of patients in prospective double-bind randomized studies are worthwhile to confirm the efficacy of NSAID (mainly, COX-2 inhibitors together with aspirin) in the prevention of coronary events in acute coronary disease patients. Surely the medical community will welcome new data for resolving the complex and apparently conflicting data concerning the prevention of thrombotic coronary events by the use of selective COX-2 inhibitor drugs. This can only be answered through large well-designed clinical trial.